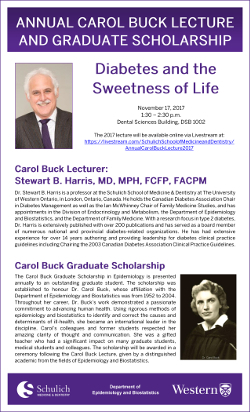 The Annual Carol Buck Lecture: "Diabetes and the Sweetness of Life"
Dr. Stewart B. Harris is a professor at the Schulich School of Medicine & Dentistry at The University of Western Ontario, in London, Ontario, Canada. He holds the Canadian Diabetes Association Chair in Diabetes Management as well as the Ian McWhinney Chair of Family Medicine Studies, and has appointments in the Division of Endocrinology and Metabolism, the Department of Epidemiology and Biostatistics, and the Department of Family Medicine. With a research focus in type 2 diabetes, Dr. Harris is extensively published with over 200 publications and has served as a board member of numerous national and provincial diabetes-related organizations. He has had extensive experience for over 14 years authoring and providing leadership for diabetes clinical practice guidelines including Chairing the 2003 Canadian Diabetes Association Clinical Practice Guidelines.